This is am old pix...but I still like it . Remember the first time we saw them together in Japan ?? He he...my hunch was right....BYJ and KHJ did go out together to grab a bite. According to 5StarsAs1 [shared by lnprz at LKHJ.com...thanks ^^] on the 3rd of Feb, BYJ and KHJ along with 10 other staffs, went to this restaurant for lunch. BYJ and KHJ sat opposite each other and shared a plate of tempura together [cr: 小绿蜻蜓 @ weibo...thanks !]. Ok...my imagination just went into overdrive...*imagining Yong Joon ssi and Hyun Joong across each other...a large plate of tempura between them...Hyun Joong hungry, but waiting for Yong Joon ssi to start spearing the tempura...he he he...* They're both quiet...so maybe it's just munching munching for a while, once there are some tempura in their tummy...they'd begin to talk.... They say Yong Joon ssi went back to Korea on the 3rd....so it must have been some time after this. 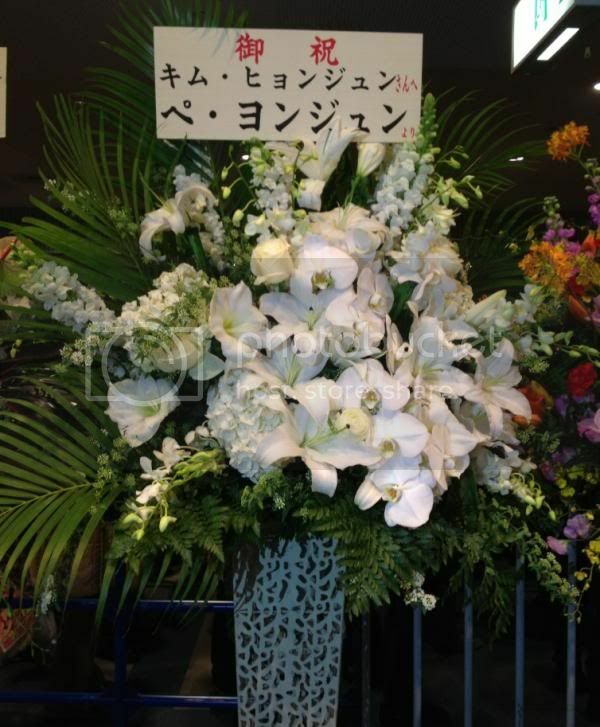 As he has done for previous KHJ events, BYJ sent KHJ flowers for his Yokohama debut event, as you can see here [credit : Inprz@ LKHJ.com, tomato99, thanks ! ].